The Queen and I are delighted to be back in Beijing, in this fascinating capital of politics, business, culture – and so much more. And we are pleased to see representatives from so many companies and institutions gathered in one place. This is a reflection of the strong economic relationship that has developed between Norway and China. Norway’s economic relations with China go back a long way – to our maritime activities in the 1800s. Norwegian ships followed the trade routes between China and Europe, but also found profitable business opportunities in the vast shipping networks between China and its Asian trading partners. We have learned from history that trade is an agent for change. Trade networks not only affect our economies, they also influence the way our societies relate to one another and the way our cultures develop. Many of the technologies that are in focus here today were not even conceived when I first visited China in 1985. Now, modern China is meeting modern Norway. The maritime sector is still a cornerstone of our economic relations. However, today the maritime industry is not only about the transport of goods. It is a driver of global innovation and technology development. 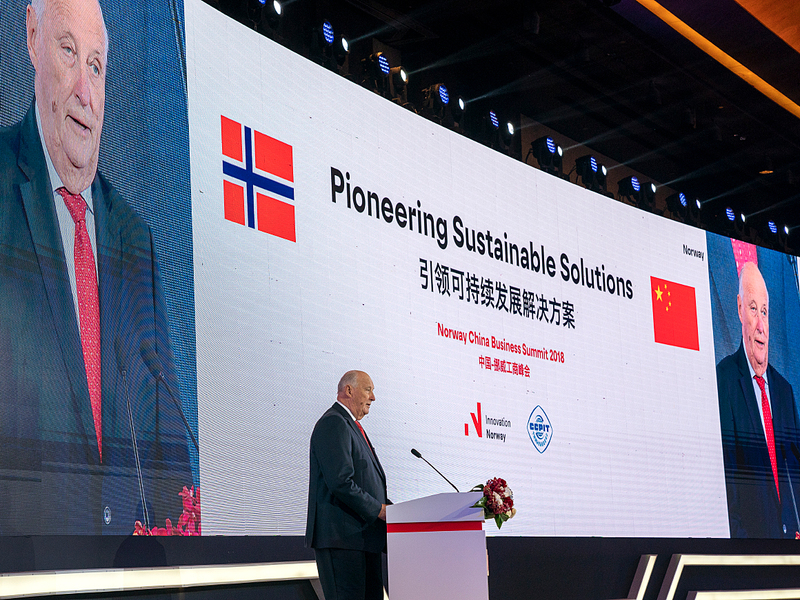 Norway and China are grasping new opportunities and working together to develop safer, greener and more efficient solutions for the future. Both Norway and China are undergoing significant economic and demographic transitions. As we expand our trade and technological cooperation into new areas, such as medical, welfare and environmental technologies, we must learn from each other’s challenges and successes. Our economic relations are thus about far more than just business. They also create a room for political dialogue, cooperation in the field of education, and important scientific networks. Finally, all countries, both small countries like Norway and big countries like China, depend on predictability and a level playing field. The fact that we share a broad range of common interests strengthens our relations, but also makes us vulnerable to the challenges facing international trade today. To address these challenges, we must further develop our international partnerships, while also safeguarding the multilateral trading system and the benefits it has brought us. I feel confident that the combined efforts of our companies, our governments and our institutions – all of which are represented here today – will enable us to tackle our common challenges and to develop new and sustainable partnerships. I wish you every success in dealing with the important tasks that lie ahead.